In this post, I show where you can turn off noise reduction in Nikon Capture NX 2, and two techniques for performing noise reduction (NR). If you shoot RAW images with Noise Reduction turned on in-camera, you’ll see that noise reduction is also applied when you open the NEF file in Nikon Capture NX 2. 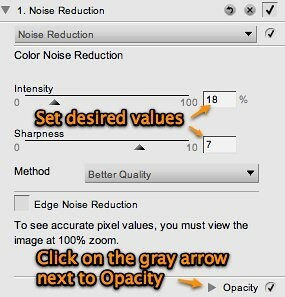 The graphic above pertains to the noise reduction setting sliders that you can access from the Edit List under Develop > Camera Settings. Note also that the intensity is set at 18 while the sharpness is set at 7. These are the default values if you had shot the image with in-camera High ISO noise reduction set at On (Normal). 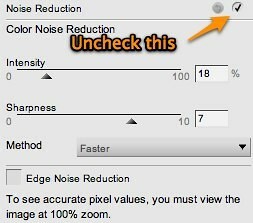 To turn off noise reduction, simply remove the tick in the indicated checkbox. The 1st technique simply involves putting a tick in the indicated checkbox (or leaving it on in the first place). 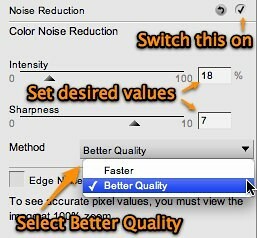 Next, select the desired values for Intensity and Sharpness, and make sure you select Better Quality from the Method drop-down list (the default is Faster). Even though this works well in most cases, there’s something you need to know about the noise reduction Capture NX2 performs. From the screenshot, you’ll notice the words “Color Noise Reduction”. You would expect that NX2 only performs chroma noise reduction, but if you look closely, you’ll notice that luminance NR is also performed. 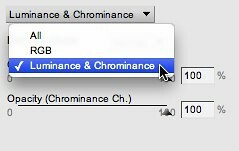 If you want only chroma NR to be performed without touching the luminance channel (a.k.a. detail), you’ll have to employ the 2nd technique. Using this method allows you to adjust the opacity of the luminance and chrominance effect of the noise reduction, which is similar to what you can do with Photoshop layers. Firstly, make sure you turn off the default noise reduction in the Develop > Camera Settings section of the Edit list as explained near the beginning of this post. You’ll see a new Adjust section appear with an empty adjustment step (labeled ‘1. Select Adjustment’). 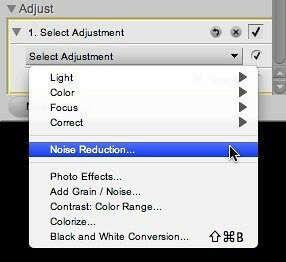 Click on the Select Adjustment drop-down box and select Noise Reduction. At this point, the labeling of adjustment step changes to ‘1. Noise Reduction’. Next, set the desired parameter values. 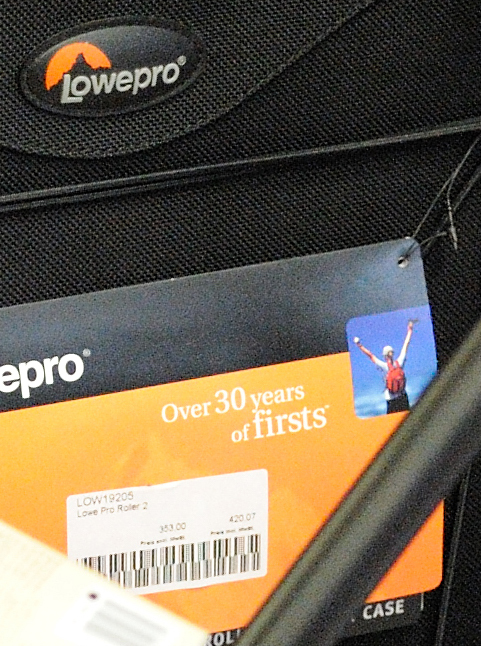 I normally enter 18 for intensity, 7 for sharpness as per the default values for Normal noise reduction. Don’t forget to select Better Quality for Method. Here are 100% crops from an ISO 6400 photo taken with the D700 (see this post for the original files) — I’ll leave it to you to decide which NR method you prefer. Personally, I would normally go for the 2nd technique of NR, but in this case, I thought the default NR method (1st technique) worked out to be better overall, despite the small loss in edge sharpness.